Thank you to everyone who took part in the long weekend (September 11 to September 14) of the visit from our twinning friends in Neuwied. And thanks particularly to our committee member Lilian Clarke who was in charge of the arrangements for the weekend. And to The Parklangley Club, who played Tennis Club Neuwied e.V. 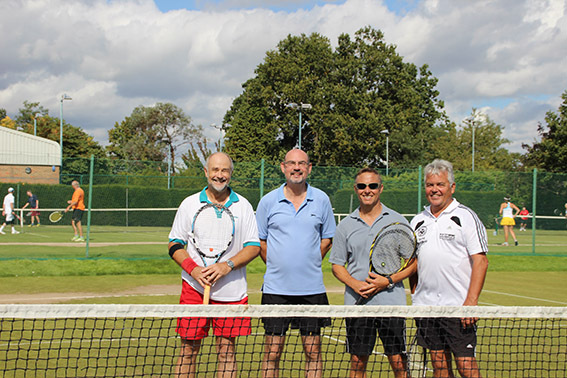 for the fourth time in a now well established series of exchange tennis matches and who hosted the Scottish themed dinner on the Sunday night. And to All Saints' Church, Orpington, for their pioneering link-up with Evangelische Friedenskirche Heddesdorf – Heddesdorf is one of the towns that make up the Neuwied region. 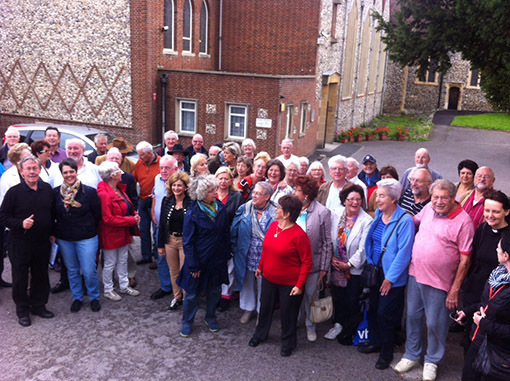 The biennial exchange visits by BTTA and by the Freundeskreis Neuwied-Bromley are one of the major reasons why our twinning link continues to thrive and they also give members of our associations an opportunity to renew old friendships and to meet new people. I sensed the recent visit by our friends from Neuwied to be one of the best ever. 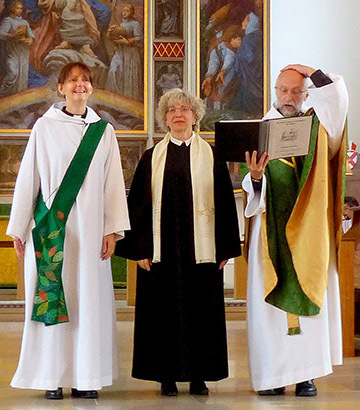 Above all it gave me immense pleasure to see partnerships continuing to develop outside of the formal BTTA-Freundeskreis structure – between the Park Langley and Neuwied tennis clubs and also the more recent fellowship between All Saints' Church Orpington and the Evangelische Friedenskirche Heddesdorf. Even more special to me was that these partnerships have great potential for building links between younger people in our two towns. I hope that the BTTA and Freundeskreis will do what they can to focus on this opportunity as well as helping these new partnerships to continue to flourish. The guests of my wife Lynne and I over the biennial weekend were Jo Hofmann, Andy Jung and Susanne Tibus whom we know well because, of course, Lynne and I have been associated with Neuwied for much longer than our membership of the BTTA. We made our first contact in 2001 which led to a carnival partnership forming between Bromley and Neuwied in 2002. Thereafter, we developed our carnival partnership through the activities of the Miss Bromley Pageant which we continued until 2010. 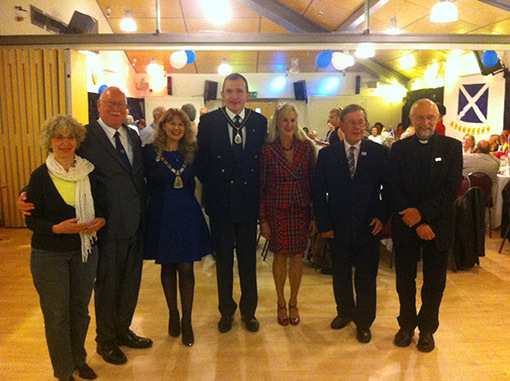 Over those years we had boundless support from Neuwied’s Lord Mayor Nikolaus Roth and from Jo Hofmann in his capacity then as President of the Festausschuss and of the Rot-Weiss carnival association. We were also given much warm friendship and support from the Freundeskreis through Wilhelm Koehler initially and then Inge Gütler. And so I felt a warm feeling run through me when, at our last evening together on the Sunday – the “Scottish Evening” – Jo Hofmann, as Inge Gütler’s successor as chairman of the Freundeskreis, told how our carnival friendship was his introduction to the town twinning partnership. The Scottish Evening was a superb occasion and it was wonderful to have with us the Mayor of Bromley, Councillor Kim Botting, in her capacity as the BTTA President. 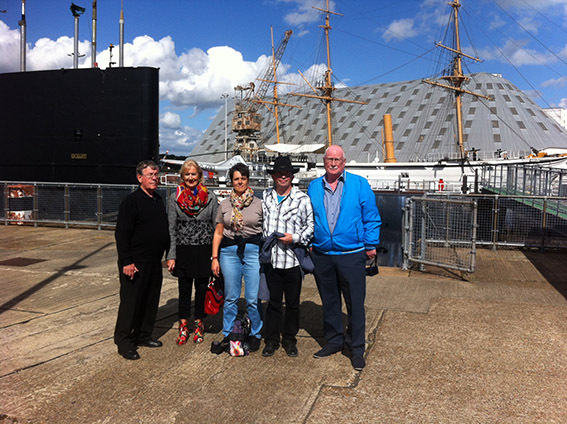 Our outing to Chatham Dockyard as part of the weekend was an excellent choice and provoked much interest from all who went along. The short visit to Rochester was likewise much enjoyed. The weather was kind to us, the coach was near full and we all had a really good time. For Lynne and me, many who came in the group from Neuwied were friends of many years standing but there were also others who we had not met before. We took the opportunity of the informality of the day’s programme to say our “hellos”. Freyja reminded us of the story of a great hero of the Christian Faith, Pastor Dietrich Bonhoeffer, who pastored to German speaking congregations in London in the 1930s and was a close friend of Bishop George Bell of Chichester. Bonhoeffer opposed Hitler and went to his death on April 9, 1945, just four weeks before the capitulation of Nazi Germany. Freyja emphasised the importance of listening to what God seeks to teach us, which is a message of reconciliation and love between all peoples. Members of the two congregations then shared lunch afterwards in All Saints’ Church Hall. It was a very happy occasion. Earlier in the weekend, I discovered that were I ever to be made redundant by the Church of England, I could become a tour guide! I led Freyja and her husband and other members of the Heddesdorf congregation on a rapid guided tour of central London, which, among other things, took in the Changing of the Guard, a demonstration in favour of refugees in Europe and Morris Dancing outside St Paul’s Cathedral! The get-together was eagerly awaited and certainly lived up to expectations! Twenty three tennis players from Neuwied came over, and it was encouraging to see several youngsters - one had enjoyed her visit two years ago and this time brought a friend with her. Events kicked off with a BBQ at Zena's house on the Friday night to welcome our guests, more of whom enjoyed home hospitality this year rather than staying in hotels. On the Saturday morning the friendly tennis tournament began, with many of the Neuwieders getting their first experience of playing on grass rather than the clay courts back home. This seemed to give the Parklangley players an advantage, as they came out overall winners. As on previous occasions, the pairings were then mixed, with English and German players partnering each other in a true spirit of international friendship. We broke new ground in October with a German food evening courtesy of Bromley College at their Orpington campus training restaurant BR6. 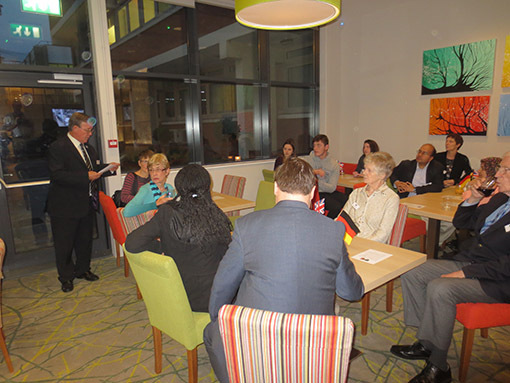 Our chairman Peter Brown is shown, below, welcoming some 30 guests. The excellent traditional food was prepared by the catering students and our guests were teachers and students from German departments in local schools. Schools represented were Darrick Wood, Newstead Wood, Langley Park School for Girls, Farringtons, and Charles Darwin. The occasion gave all of us a chance to talk together about Germany and its culture and language and in a very impressive environment. 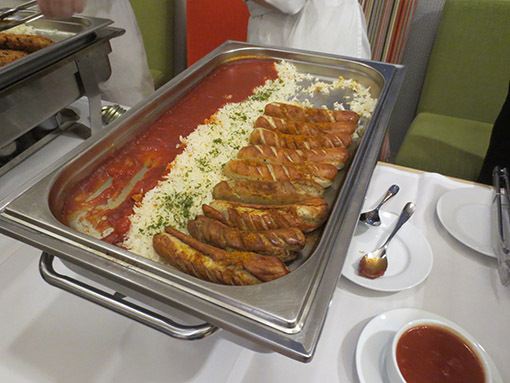 And, of course, enjoy the delicious food like this wonderful Bratwurst above. Two important events for us over the summer were the Keston Countryside Day in June and the August Bank Holiday Cudham Village Show and Fete. The weather was not kind to us on either occasion – a permanent risk of any English summertime event – but our members braved the elements to spread the word about town twinning. Our Cudham visit is shown below. Der deutsche Stammtisch trifft sich normalerweise jeden ersten Dienstag im Monat. 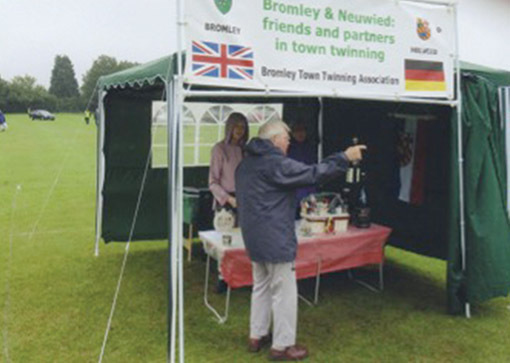 You certainly don't have to know German to be a member of the Bromley Town Twinning Association but we have a number of members of varying degrees of fluency in the language. So if those members would like to keep their fluency up – or even improve it – then come along to the German "Stammtisch" group. They meet every first Tuesday of the month at 8.15 at the Orpington Liberal Club bar. For further information please contact Gerda Loosemore-Reppen on 01689 859225 or 07989 375190 or email g.loosemore@ntlworld.com No need to book, just turn up. Traditionally in German taverns, the Stammtisch is a table is marked with an often elaborate sign reserving it for regulars to have a good old pow-wow. Our Facebook site provides an opportunity to gossip about town twinning and all matters related to it such as the contrasts between life in Bromley and Neuwied. Not enough of our members are participating and we do urge you to join in this very engaging way of keeping in touch. Just to remind you that our friends in Neuwied are happy to lay on hospitality through the year if you want to visit Neuwied on your own. In late February or early March each year, Neuwied is one of the Rhineland towns celebrating their traditional Karneval (Carnival). It's a colourful occasion well worth visiting as you can see from our Karneval page. In 2016, Karneval will be from Thursday, February 4, to Tuesday, February 9 – so Rosenmontag (Rose Monday), the height of the celebrations, will be on Monday, February 8. Each year in July, the town holds its annual festival, the Deichstadtfest, on the second weekend of the month. In fact, it's a long weekend from Thursday to Sunday. In 2016, it will be from Thursday, July 7, until Sunday, July 10. Our Deichstadtfest page gives further details.